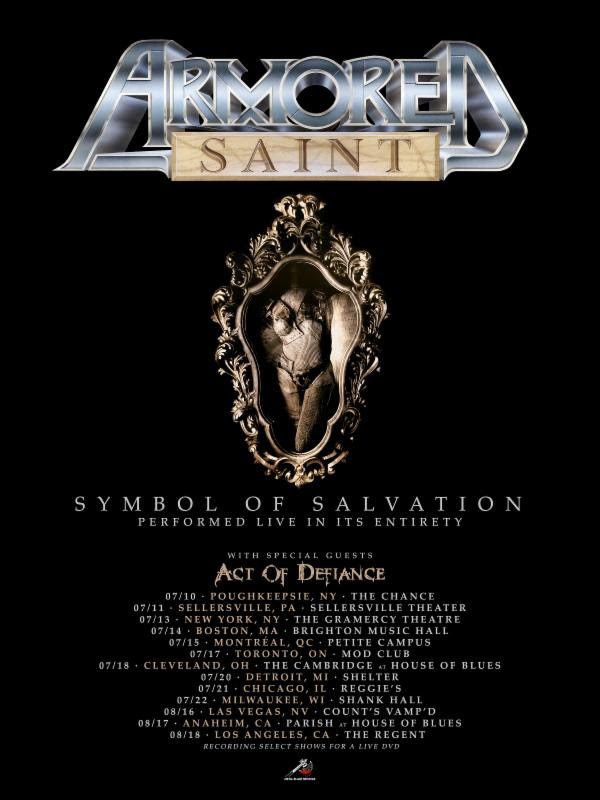 This summer, ARMORED SAINT will embark on a North American tour commemorating their classic Symbol Of Salvation full-length. On this special thirteen-date run, the band will perform the record in its entirety, with select shows to be recorded for a live DVD. Support will be provided by labelmates Act Of Defiance. See all confirmed dates below. Frontman John Bush comments: "Symbol Of Salvation! Arguably ARMORED SAINT's most important record. These songs came out of us being dropped from Chrysalis Records and finding out about guitarist Dave Prichard developing Leukemia. The songs took on a much more emotional meaning than any other previous record. We wrote songs of desperation like 'Another Day' and 'Last Train Home,' experimental tunes like 'Tainted Past' and 'The Truth Always Hurts,' and classic SAINTrockers like 'Reign Of Fire,' 'Dropping Like Flies,' and the title track. After Dave passed, the band regrouped with Phil and Jeff returning as the guitar tandem. It was a family again. Dave Jerden produced the record and this marked the beginning of Joey becoming the producer of the band. It's going to be a memorable tour. Songs like 'Burning Question' and 'Spineless' we've never played live before. Come share it with us. Let's make Dave proud." To further celebrate the legacy of this album, Metal Blade Records will reissue Symbol Of Salvationon CD and LP on May 18th. The LP will feature a vinyl remastering from Patrick W. Engel as part of the "Metal Blade Originals" series. Special treatment and 400-gram heavy cardboard spine sleeves (inside out print), 60x60cm two-sided artwork posters and 250-gram inserts guaranteed! The CD will include four bonus tracks. Preorder your copies now via Indie Merch, EMP, or eBay! After being dropped by Chrysalis Records in 1988, ARMORED SAINT began writing for a new record and searched for a new label. During 1989, founding guitarist/songwriter Dave Prichard was diagnosed with Leukemia. In January 1990, Prichard was hospitalized for a bone marrow transplant but succumbed to the treatment, passing away on February 28th, 1990. By this time, the band was writing as a four-piece, with Dave being the sole guitarist; they had written twenty-five songs and demoed all of them. Metal Blade Records CEO/founder Brian Slagel approached ARMORED SAINT and offered a recording deal in late spring of 1990. They regrouped with original guitarist Phil Sandoval and Jeff Duncan, who was hired as a touring guitarist during a 1989 tour with King Diamond. The recording of this new album - which would become Symbol Of Salvation - began in the winter of 1990 with producer Dave Jerdan (Alice In Chains, Janes Addiction, Red Hot Chili Peppers), and it was engineered by Brain Carlstrom (Alice In Chains, The Offspring, Rob Zombie). During recording, the band used a guitar solo from a demo track played by Dave, and included it on the song "Tainted Past." ARMORED SAINT toured with the likes of The Scorpions, Suicidal Tendencies, Wrathchild America, Sepultura, and more, in support of Symbol Of Salvation. Now, in 2018, the band brings back these classic tracks to the live setting, for fans to enjoy once again, in honor of Dave's memory.